Thanks for being a great captain, and I appreciate the advice you’ve given us. Thanks: your calm and precise directions during the sail were exactly what was needed. Thank you for your patience and willingness to teach. Thank you for your calming spirit and gentleness. It was so needed and appreciated. I got the word wise when I was praying for you. You have so much wisdom to give and share and it is needed and valued. Chris I’ve had fun chatting with you every once in a while. You are full of knowledge and insight into many things. Your ability to keep calm during stressful parts of the sail is what kept me from losing my sanity. You are a great captain. You are a joy and a blessing. I learnt many things from you being captain. Thank you for always being so helpful and calm. You always knew how to lighten the mood with a funny story; those were much appreciated on the sail. Thank you for being such an amazing captain! Thank you for bring such a calm spirit and attitude during the sail and life on the boat. I appreciated your kindness to me and to the whole team. Chris thanks so much for all your experience and patience with us in the sail. You’re a legend! Chris! You’re probably the greatest captain there is. Thanks for your humour and putting me at ease during the storm. everything I have learned this week, and for being able to get to know all of you. I want to say thank You very much so much to You and Chris first and Vo too. I’ve learnt so much. You’re a very special and brave woman. Never give up. Never surrender. I hope You finally had fought the better solution as possible to those problems, and I want to let You know that it was a very special week for me. Only God knows, but I believe. You had show me a new way, and your strength and perseverance makes me believe again…Maybe You don´t understand what i mean, but every little thing is very important. I think that I forgot that. Anyway. It was a pleasure for me being there with You and help in little things in Soteria. If You need my help in Soteria or in anything else, You can count with me whatever It mate takes. I will contact Mr Udo as soon as possible about his tools. I send You some pictures that I took. I hope You like them…and excuse me for my bad english too!!. hehe. with us when we don’t always listen or follow instructions. Subject: Thank You for Soteria! I am Misha and it is me who has been staying on your boat from time to time. It all started with a barbecue 2 moons ago @ the dock, where I had 5 Norwegian friends who were sailing around the world performing sirkus for people and kids. I met a jolly funny man with whom I easily found the same language so to speak. This was Chris and I was surprised that there are so many Chrisses on the same dock. So I asked Chris if I could have my big backpack and spend some nights at the boat before leaving for the other side of the island. Chris found already on the next day something to do for me on the Soteria so I was happy to help him out and at the same time learn something new about the sailing life, even if this one is not at sea 😉 I became interested and happy from inside to do some more things on the boat and told Chris that it would be a pleasure to come back and stay with you after I’ve visited Gomera. I surely enjoyed the island and met AMAZING people who affected me in all kinds of ways, I’m grateful for that, thank You all! I came back to San Sebastian with intentions to sail with a Belgian guy to la Palma (one more time), where I had a girl I thought I was in love with… but life had other plans for me so I decided to spend some time in San Sebastian and see what would happen. I asked Chris if I could have my backpack on the boat and was sleeping at the beach but noticed Alice who was visiting and faster than I could say ‘Dallas salad’ backwards we were like a family on-board Soteria. With me cooking and sowing my always in need pants, Chris reading us morning stories and busy as an ant Alice making fresh scones. The atmosphere was something profound and heart-warming since I set my foot on Soteria for the first time and now it was glowing of radiant light with Chris humour, my socialness and Alice’s careness. No other boat I’ve encountered was the same, this was like a sanctuary for a a human being, diving instructor, captains, Danish people, visitors, a tired traveller, passer by the dock, vacationer (even if working), a family, bubble maker, a believer. Believing that wherever I am in this big/small world I have the blessings to find people and a place like this. 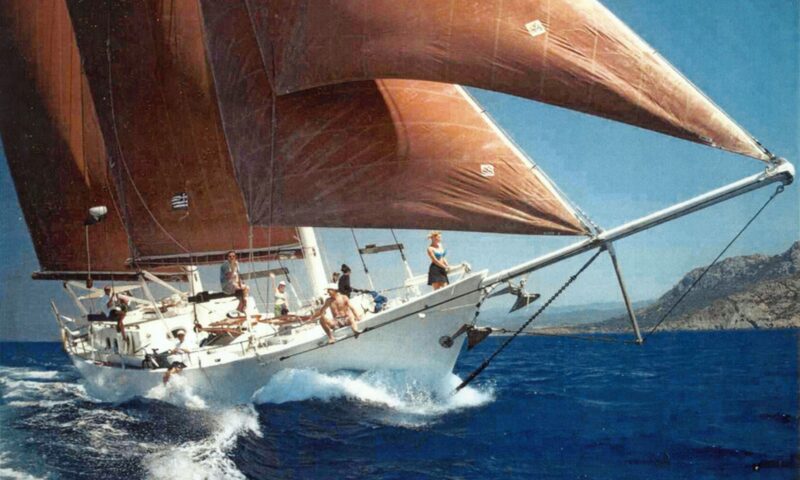 Apart from this experiences I had the honour to be thought how to work and sail, how to be listen and be listened to! I will never forget Soteria and all the light it has multiplied in my life. Don’t change your heart but stay flexible and open as you are Soteria. There’s time to meet and time to part, we stay connected in our hearts! Love, Laugh and there you are the Light! I’ve run a report comparing behaviour and achievement points in the two terms before the trip and the 2 terms after the trip with the 5 students who were particularly vulnerable and at risk of either bullying or exclusion. And the story is amazing. A massive drop in bad behaviour for H and M. A significant drop for T (autistic student) also. Plus a huge increase in achievement points (rewarded for good work and effort) for all save one. All students can be seen to have benefitted hugely. With H, T and W the change is so dramatic that we really can claim that it was a life changing experience for them. T is an autistic boy with complex difficulties significant behavioural problems. H had been excluded on several occasions before the trip and was at risk from permanent exclusion. W was a severe risk of failing school through bullying. There have been no bullying incidents since the trip. Can I stress that the impact on these young people really has been amazing. The other 3 gained a huge amount also (though these were less at risk students). can. Thanks of my heart ……… (but I think that we share very very much) Oh! adventures: donuting, exploring caves, climbing up the mast and of course the storm! person said that it gave her the courage to think of starting something new in her life. letter, because I did not suspect that you had that big problems. may be just something that I wanted but nothing He wanted for me. again and again talking about God calling us to do something for him. am thankful that God confirmed me to be on the right way. Don’t let anyone jump off high cliffs, just tell them to call me! and an inspiring heart for God. May the Lord bless you all. hearing all your testimonies! Chris you are a superb skipper for sure! Thanks again! the time at the boat changed them. You don’t do that ‘special’, you are just yourself. learned, just do things, especially when you like it! and that’s also good for me. I’ll never forget you, thank you for this time. God Bless you! I’m missing you! Please don’t look at the mistake’s in the letter. together. Thanks for the picture! (human beings in common and Christian in special) have to learn things the hard way. And I think that is what will happen. How are you? Are you a little bit lonely without Andy and Julia – and of course – us? free time – time to pray, to think about, to read the bible, to enjoy the nature and so on. trip was a real start for this. Do you understand what I mean?! it was a good start at home / at my work. send me the mails from time to time. matter what education they have. I really miss talking to you…. do this so its done…. Now it will take some time ajusting to the new life…..
Emilie our youngest and Harmonie our oldest. constantly have guests who come and stay for a few days…you are welcome here. you in Greece…have you ever done that? As for you and a sailing ministry, I am not aware of such a thing…does it exist? pray that God will give you the desires of your heart in finding a ministry. risk of being hurt is smaller. many people, even Christians, are very lonely in difficult situations of their life. wouldn’t want to miss out on the experience! a slow day today if you can believe it. Nice greetings to everyone else. The one and only ——-. I don’t really know what I shall write you…. for me you were the perfect skipper for the boat, but let me try to explain you something which I think is important for you to know, because I experienced it myself in some way, and because I can see this thing happen to one of our doctors every day. You are a very clever and intelligent person. You know many things, and you know exactely (is it the right spelling?) how to do your work. You like to do your work better now than later, but you are also very a very efficient worker, that means you know what you need to do, which rules you have to accept and which are just there to be there, so that it is not to important to take care of them. (Which is not negative). If there a three ways to do things, you can accept people using a different way than you do. Our doctor is somehow like you are. What now happens is: People like M and T (which are really lovingworth (do you have that word????) people), get upset because they are very correct and perfectional. They love things to be done in always the same way and in their way. It is not because they want to upset or mistreat somebody, it is just in their character. (Like we all have bad habits). They don’t want to be like that, but it makes them crazy if things are done different or if rules are not kept. The second thing that happens is: People around you (I can see it happen to our doctor every day) think you are arrogant because you know so much and you tell it the people around. Not because you want to show them how smart you are, but because you want to help them to make their lifes and work easier. But they think you want to be something better than they are. Or you varie the way of doing something because you know it doesn’t really matter… it makes them crazy. Like today: usally we remove the sutures (stiches) at the 11th day, but today our doctor went to a patient and forgot it. I was supposed to tell him that he forgot it, but I knew he had to do one more emergency surgery in the afternoon and would not be able to leave the hospital in time, that it was clear to me that he would not do it today but tomorrow, because it doesn’t really matter if it is the 10th, 11th or 12th day. Although I told him that he forgot it and he said “we will do it tomorrow”. I told my colleagues who was still at work and she got so angry “I knew it, why didn’t he ask me this morning, he can’t just do what he wants…., he is always like that.” I responded “that is not true”, but she did not listen to me. He is to good, knows to much. Sometimes (or often??) this things happen to me, too, but through the last years I learned to handle it a little bit better, I try to read in the faces when I correct other people. Some days they tell me how fantastic it is that I know so much and on other days some of them seem to hate me for that. So I love to work together whith our doctor because he does good work, he is reliable and he relies on my work, without being afraid that things are not done in the right way. I think that this is the base (basis?) of the problems you had with the crew. And Chris, just for you to know I was sitting in front of my PC and thinking what shall I write him and I asked god and suddenly all this thought came to my mind. There is another thing you could do: Last year on the boat J (the cook) said, that she loves to work on the boat but that it isn’t always easy (for her and for you 🙂 but I know God has a plan with you and your live. When I am upset I love to read Psalm 6 especcially the last verses, because David is so despairing and this is ok for God. We don’t need to be happy every day. Chris I’ll pray for you. When I say that I miss you I mean it honest. For me you are an important friend, I really feel a deep love (hope you don’t understand that wrong know) for you and I think of you very often. This may sound strange, but I want you to these things know in the hard time you have at the moment. Being with you always meant for me feeling save and being able to learn a lot. I hoped to be able to come to Greece in November or so to meet the others at the camp and especially you… know I hope their will be another chance to see you again (before we are in heaven). Until then please don’t forget me and keep mailing me, ok? Hope I was able to help you at least a little bit and to give you some hope. From my sister Martine I heard you left the Genevieve. I am so sorry to hear that. It didn’t surprise me, as one of the reasons I left Greece was that I couldn’t stand anymore the negative stories they (especially M—–) told about other staff members. This was one of the things that really bothered me there and you were one of the reasons I wanted to stay because I was so much looking forward to sail under your command. I thought that when we would work together during the summer things with the ‘mainland’ would be more on a distance. When I had a hard time in Greece, I tried to keep being focused on the summer, but I just couldn’t hold on anymore so I decided to go home (regretting so much for my stay on the boat). During my stay in summer at the boat I really enjoyed your presence, your way of doing things (letting people discover it by themselves and help if necessary), but also your way of ‘being christian’; just relaxed, not forcing anybody, interested in the story of the other, with humor. I especially appreciate so much that you send me a short note of encouragement after my leave in Greece. You were the only one who letted me know something as this was of so much worth for me. I will pray that God will show you the way you need to go now and take good care after you. I wish you all God’s blessings and hope to meet you one day again, maybe not here but in heaven.